From the Gospels and Acts to the Epistles and Revelation, the whole of the New Testament proclaims the truth that salvation is not the result of man’s works or choices. 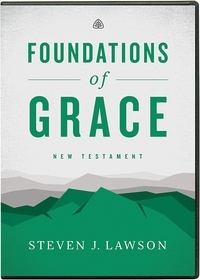 Dr. Steven J. Lawson continues his journey through the Bible in this New Testament volume of Foundations of Grace, showing us that the doctrines of grace are found throughout the whole of the Bible—both Old and New Testaments. You can also order the Old Testament volume or the complete two-volume set.